The announcement took place this morning with remarks from Frances Brown, President of Red Hook East Houses Residents Association, Ya-Ting Liu, Executive Director of Friends of the BQX, and John Samuelsen, Local 100 and TWU of America International President. According to the Daily News, Samuelson, who’s also on the board of the MTA, says the project will add several hundred well-paying jobs to the union, including streetcar operators, drivers, supervisors, and maintenance workers. He also feels it would give a boost to the local manufacturing economy if the streetcars and related equipment are made nearby. More support came in the form of $245,000 in donations to de Blasio’s Campaign for One New York from seven developers who have projects along the streetcar’s proposed route, including Toll Brothers, Alma Realty, and Two Trees. In response to the memo, a recent op-ed in Crain’s “laid out an idea for the city to sell air rights in the Brooklyn Navy Yard neighborhood to raise money for the project,” as 6sqft reported. 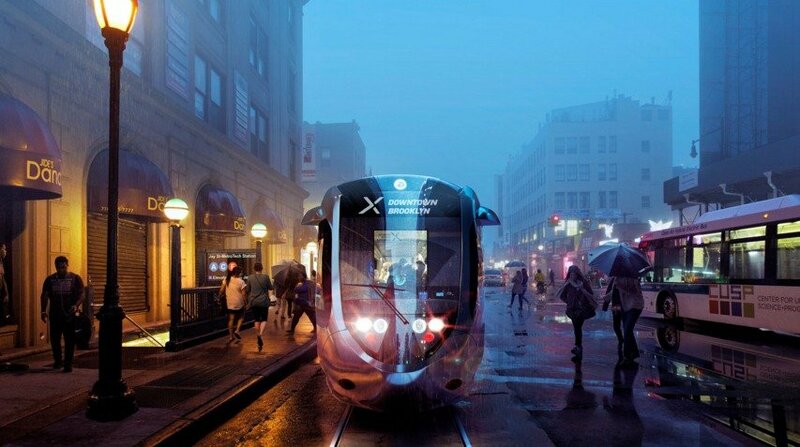 The Navy Yard has between 15 and 20 million square feet of development rights, and since it’s city-owned land, the sale of these air rights could in turn fund the BQX. Nevertheless, the financial viability of the project won’t be fully determined until the end of the year when KPMG completes an analysis and audit.